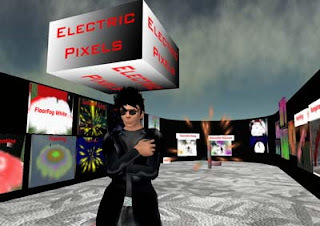 This always happens to me: I am visiting SL friends, and suddenly connections are made and I am off building something for someone. I don't mind doing this (especially if I get paid!) because it means more exposure for me – both others seeing what I do, and me seeing what others are doing. The more you understand your SL market, the better. I take every chance I get to learn what's going on. “OK.” I don't mind showing off – my effects are usually quite a lot of fun anyway. I showed off some of my fogs and poofers, but she got very excited when I demonstrated my hearts poofers. “Wow!” she said, and “Hold on a minute,” just before disappearing. Moments later I am summoned via TP to a dance club, where I am introduced to the owner, another very nice lady. She likes the effects and buys several on the spot, but goes on to explain that they need something to spice up the club's lounge area. We visit the lounge and I recommended a few changes and suggested that I could build a custom particle effect that might work. A few days later I had created a unique effect for that club's lounge – and the owner bought it on the spot. Suddenly, I was a virtual contract worker! Items that are custom built for one are often resellable to others. In other words, you just received a great idea for a new product! Use it! Connections. Meeting people is always important, because not only do you gain social value, you also gain a potentially useful connection for future activities. Who knows when you might need to have a buddy who builds japanese furniture? So, when ever I have the time and the ability, I do take on special contracts. It's just good business. Of course, parcels and their operations come and go, so no matter what area I select it really won't make much difference over the long term. Hopefully, I will score some land soon. A customer came by my store the other day and convinced me to set up a secondary shop location in his mall. He says he gets lots of traffic (verified by Linden Lab stats) so it should be a good deal for me. Even better, he's giving me a few weeks at no charge so that I can see how it goes. How can I say no to a fellow Canadian? So I've set up this new shop in Monowai, and it's basically a miniature replica of my main shop. I've put in a small selection of the most popular products, and built a single custom demonstrator unit to show them off. Also, the demonstrator automatically triggers a brief random demonstration every five minutes to attract passers-by. Advertising is used by consumers in a very simple way: search -> results -> select one of them -> TP to shop location. There is no need to have more than one shop location if you can instantly TP to any location from a search hit. Why spread your advertising L$ budget over several ads when you can concentrate that money on one ad that would get higher search ranking? My bottom line on mall advertising: if you already have an advertised main location outside of the mall don't bother advertising the mall location. Spend it on your main advertisement instead. So, I now have a second shop in a second location and I am depending on existing mall traffic to drive results. Apparently there is a busy club nearby so I am hoping to grab some customers from that traffic. We'll see what happens. One Hundred and Seventeen is no longer my favorite number. My measly 512sm parcel is now full – all 117 prims have been used by my products and very rudimentary shop structure. No personal items (e.g. Mansion, Bowling alley, Battlestar Galactica replica, Rideable pet elephant, etc.) using up scarce prims are allowed on the property. If it doesn't contribute to the sales process, it isn't on the site! Ultra-simplified building technique. Yes, this means no roof, using ramps instead of prim stairs, plain walls w/o prim-riddled adornments, etc. Embedded gadgetry. Need a notecard giver? Or a visitor counter? Put the script in the floor or walls, not a separate object – and for god's sake don't ever use more than one prim for something like that! In spite of the “advanced” or “efficient” (or just plain cheap) techniques above, I am STILL running out of prims. Maybe I have too many products? Hah! I must figure out another way to expand my business. I wrote earlier about addressing products towards specific genres, and now I believe I've found another one: Romance. Sure, we all hear about the incredible dramas taking place between people (and non-people – it's SL after all!) It turns out that these situations do require products. Romance in SL, like RL, requires not only time and a great personality, but also items that help establish the mood. Things such as shape, skin, hair, clothing, smell (well, not smell!) and particle effects! I've created two items that seem to be quite popular with the Romantics: a hearts poofer that gently blows away in the wind, and a fogger that produces pink and white colored fog. I call it “ValentineFog”. These are obviously not for everyone, but some people are really turned on by them – well, rather they are affected by how the effects alter the mood of the situation. It's kind of like art: it's not what it looks like, it's how it makes you feel. That's what is going on in SL: people are trying to achieve meaningful alternate situations. Particle effects, clothes, music and other factors can dramatically affect the situation's mood. There is clearly a market for these items. Come and try them out via live demonstration at my shop in Caso Milo! Maybe I am a Particle Artist, instead of a Particle Engineer? A few weeks ago I wrote about how I discovered how to listen to customers. As I described before, I simply spend time in my shop and chat with prospective customers to find out their needs. It's most important to speak with customers who don't buy anything. You see, they want products You Don't Make. Actually, it's products You Don't Make Yet! By now I can say that perhaps half of all my products were created as a result of requests from prospective customers! These are people who would otherwise have TP'd out of my shop without having purchased anything. Even better, the products that tend to sell the most are usually those that were originally special requests. This makes sense – somebody wanted it, and therefore it is likely others may want it as well. Listening is most definitely a successful strategy.